When the salmon calls, you've got to answer. That's exactly what I did. Who would have thought that almost 30 years later, I'd still be doing it and enjoying it. Bringing the freshest fish right out of the cold North Pacific and slowly, over Alderwood coals, making the best smoked fish there is! That's what our customers tell us. Sunset Magazine agrees with them, and Frommers, GQ, and the New York Times. And great articles from the San Francisco Chronicle and Serious Eats, too. Most important, that's what my wife, Sally, said when she bought some fish from me at a farmers market almost 30 years ago and decided not to let me go. 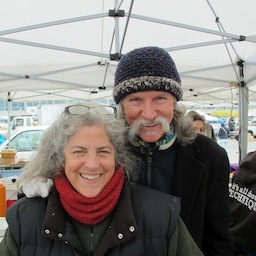 Together we sell our fish at the beautiful San Francisco Bay Area farmers markets, talking and laughing with the people all day long. At my first farmers market in Redwood City, I didn't have labels or fancy packaging. No prices even. I just guessed at what each piece was worth. I tossed my first batch of smoked fish on the table and it was gone in just over an hour. And it's been fun ever since. I found my wife and a world of friends at the farmers markets. Bringing the best fish to the best people, it's all about loving what we do. In my former life I was a Protestant Minister and business executive. For down time, I'm a North Coast Bohemian, still playing my surf guitar and I've become a Tombstone Cowboy, too! I keep current with my theological and spiritual side of life. My absolutely gorgeous wife is a monster cook. She usually interviews me at 4am on the way to the Saturday farmers market about what I want to eat for dinner on Thursday. Kayaking our North Coast rivers is her down time. What a life! Hey, someone's gotta do it, it might as well be us.